aka The Lost Episodes of the Tom Baker years. Yes, we're in Doctor Who territory here. In this case, I'm sort of going back to the beginning. You see, when I decided one winter's day to finally sit down and out see this Doctor Who thing for myself, I kicked off with The City of Death, which was a story from the same time period as Shada - the same Doctor and companion, and the same writer! I loved the humour of it, and swiftly continued on to the series starting in 2005 - which was actually more serious in tone, but fantastic in its own right. This led me to a well-overdue reading of The Hitchhiker's Guide to the Galaxy. It was a quick read, with a few good laughs. It was sci-fi that didn't take itself too seriously. I can get on board with that. I'm currently reading The Restaurant at the End of the Universe, which is a little slower going for me, but going nevertheless. Something about these stories makes me recommend choosing a tea made from a Keurig machine - particularly a miserable machine if you can find one. I should have known that a book with the word 'Battles' in its title would be not quite my cup of tea. I didn't hate it; in fact, there were a couple of chapters that I would recommend. The actual year in question takes over 200 pages to reach, but in between there were a few people of note that had readable lives The problem for me, and this could just be a personal difficulty, is that there was an extensively long cast of characters introduced into the story. Many of them were integral, but all those Viking/Norman/Saxon names were dizzying after a while. A few more diagrams and family trees may have helped. As for tea, you'll need some help staying alert at times, so try a hearty Assam-rich blend like PG Tips or Extra Strong Tetley, or whatever is close enough to these in your area. If you like green tea, I find Jasmine scented greens tend to be stronger in caffeine content. I'm not particulary good at the outdoors. It's one shortcoming of mine I'd really like to do something about - well, that and procrastinating, but I'll take care of that another time. I spend more time in Central Park than many New Yorkers, for sure, and I made it up and down Bear Mountain (which technically, the Appalachian Trail runs through), but to rough it from Georgia to Maine is something I can safely say won't happen anytime soon. And let's be honest, it's not something most people even of a decent constitution could pull off. Bill Bryson is not the poster boy of fitness, but he's willing to give things a try which I admire. Of course (spoilers) he didn't actually traverse the entire AT, but he invested many nights eating soggy ramen noodles, bad weather, and a lack of reading material to pull together a good story about endurance, and putting up with various personalities. I'd read this in the comforts of home, or you know, leaning against a tree pretending to be a part of it all, while sipping any kind of tea you'd like, because it would have to be better than anything Mr. Bryson digested in his CRAZY LONG WALK. I liked the behind the scenes look at some of my favorite TV moments, though she was quiet about certain people - I feel like she could have said so much more about Jeremy Brett, and only ONE passing mention of David Tennant? For shame! Still, she was open about many of her career errors, the largest one in my opinion being the rejection of Pride and Prejudice (the Colin Firth version), which I don't think I'd have wanted to admit. 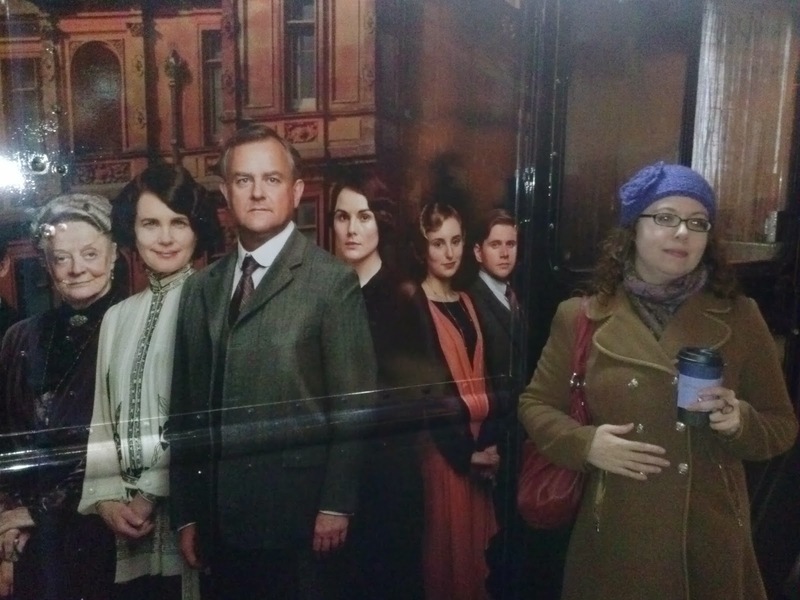 Also, the reasoning behind Downton Abbey and Sherlock airing later than it does in the UK didn't really float for me, especially since she chases that down with her dismay at the piracy of said shows. In this day and age, when people live-tweet spoilers, what does she expect? It was a little rambling, but another good quick read. I'd pair this with either the official Downton Abbey tea, or considering Ms. Eaton's line of work, a nice blend picked up from a shop in England.